In the recent past, we are seeing a reasonably strong traction for our CRM++ Quote Management tool and most of these prospects have a common yet sticky problem on enabling a price quote solutions for their CRM On Demand users – at the same time not invest in big tickets like Selectica or Big Machines. CRM++ Quote Management fits in perfectly for such prospects. This repositioning of Quote Management as a price quote solutions is expected to see road ways into many more CRM On Demand install base. CRM++ Quote Management is a SaaS based application that acts as a one stop shop to seamlessly generate a price quote to any opportunity. It gives an organization the ability to quickly create price quote and link those quotes to accounts, contacts, or opportunities. These price quote are intended to allow sales representatives to easily and efficiently provide customers with quick quotes for pricing and availability. 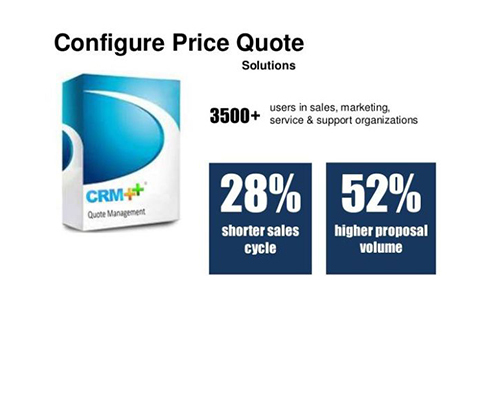 CRM++ Configure Price Quote (CPQ) solution slices through sales complexity to help enterprise sell more. CPQ enables sales reps and channel partners to recommend the best combination of products and services, construct accurate price quotes, and get contracts signed fast. With powerful, constraint-based configuration, step-by-step guided selling, and streamlined workflows for price quote, proposal, and contract management, CRM++ CPQ takes enterprise sales to the next level, increasing average deal size, accelerating sales cycles, and making global business faster and more efficient. While creating a price quote, you can associate a contact with an opportunity, add products as line items to the quote, and enter price details and terms & conditions of the quote all within a secured interface. Customize, print or email price quotes across your contacts instantly without missing on those crucial opportunities. CRMIT Solutions delivers an effective Configure Price Quote (CPQ) solution that changes the industry’s conventionally complex approach to the entire quoting process. The only choice to intelligently configure, price and quote new deals, add-on sales and renewals – inside Oracle CRM On Demand & Oracle Sales Cloud,” said Vinod Reddy, MD & Founder CRMIT Solutions. CRM++ Quote Management application is available in multiple deployment models to support the current industry requirements. As per your requirements, you can opt to keep it as an On Premise (Installed) application within your firewall, or deploy it on a cloud (Amazon Web Services, Google App Engine etc.,), or let CRMIT host it for you. This entry was posted in CRM, CRMOD, Customer Service, CX, Oracle, Oracle CRM On Demand, Oracle Fusion CRM, oracle sales cloud, Quote and Order Management, Sales Cloud, Uncategorized and tagged CPQ, CRM, CRM++ Quote Management, crmit, CRMIT solutions, Oracle, Oracle® Platinum Partner, Quote management. Bookmark the permalink. Is your customer relationship management system meeting the needs of today’s sales force? Microsoft Skype and Oracle Cloud CRM – Be where your customers are!! Nice post… Thanks for sharing this information about software.